How to use FAT Squid artificial squid lures. 10-inch long FAT Squid have a built in rattle to help attract sport fish from greater distances. They also have a custom-designed "Light Hole" that fits a chemical light or special battery-operated LED light stick. Once lit from inside with either light source, the FAT Squid becomes extremely lifelike and bright, attracting fish like a light bulb attracts moths. Fish just can't resist FAT Squid. FAT Squid come rigged with a 350-pound stainless leader, heavy duty swivels, 10/0 stainless J-hook, stainless split ring for easy and quick hook changes and a scent ball above the hook. Just add your favorite scent to the scent ball, a piece of bait on the hook and the FAT Squid becomes the most irresistible artificial lure in the world! 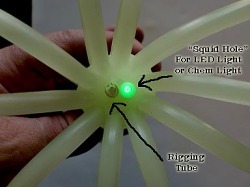 To insert a chemical light or LED Light Stick, pull the hook down to expose the "Squid" or "Light Hole." Wet the light and insert into the hole that runs parallel to the rigging tube. When inserting a battery-operated optional LED Light Stick, make sure the light stick is twisted tight and inserted with the light pointing toward the hook. This will prevent any leaking when the FAT Squid is sent to depth. After inserting either light, push the hook and stainless leader toward the top of the FAT Squid until the swivel exits the head of the squid. FAT Squid radiate light from the inside out, making them glow and very bright, especially when fishing them in deep waters. In shallow water or near the surface, FAT Squid radiate light, and the small tiny silver flecks in some of the FAT Squids reflect lots of light in all directions. 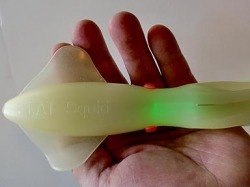 Within a few weeks more UV colors will be available for the FAT Squid artificial squid line of fishing tackle lures. Watch for "Blaze Blue," Blaze Green," and "Blaze White." Hundreds of species of fish throughout the world can't resist eating squid and make squid one of their main food sources. When these sport fish see the FAT Squid they won't be able to resist. Typically, when fish hit squid lures they hit harder because they want to kill their prey. When holding your rod, be sure to hang on tight or you might have the rod jerked out of your hands.